Like just about everyone else in the world, I’m a big fan of gold foil – but I don’t think I’ve ever seen gold foil wedding invitations quite like this! 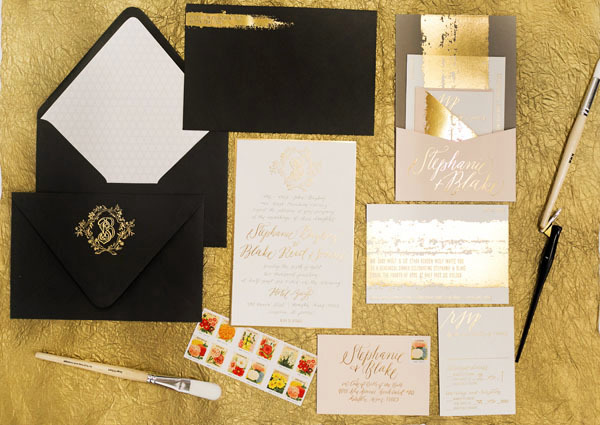 Created by the ladies of Papellerie, the invitations feature shiny gold foil printed to mimic paintbrush strokes and a combination of gray offset printing, gold foil text, and even knockout text within the painterly texture. 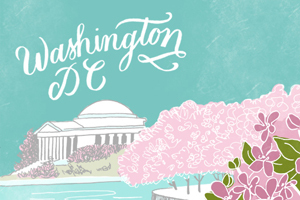 Seriously cool, and seriously pretty. From Papellerie: We had so much fun designing for Stephanie and Blake! During the creative process they realized they loved paint strokes, metallic gold, pale pink cherry blossoms, and Moroccan design, so we took it from there! The calligraphy was done by Alyssa, our in house calligrapher. The invitations incorporate gold foil and gray offset printing on the front, and gold foil with a custom pocket assembled on the back. The pocket was foil stamped with Stephanie and Blake’s names and holds the reply card and return envelope as well as the rehearsal dinner invitation in one neat little package. We lined the envelope with a custom illustrated moroccan inspired pattern which relates back to the shape of the crest on the main invitation. 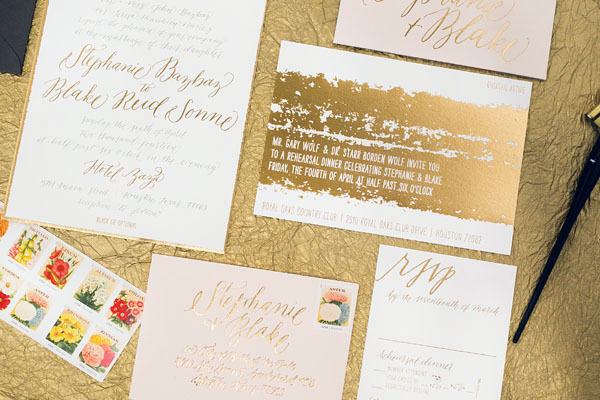 I am obsessed with gold foil and these are absolutely impeccable! I love the gold with the gray.